Nearly a decade ago, the Case Foundation declared that the millennial generation (born 1980 to 1999) would fundamentally “change how change is made.” And, indeed they have. Whether it was breaking down traditional organizational structures; leveraging technology to disrupt fundraising, volunteerism and activism; modernizing social networks; or demanding new norms for transparency and impact from organizations; this generation has reshaped the social sector in ways that we could not have anticipated. Now, having disrupted the social sector, millennials no longer fit the traditional definition of a changemaker. Today, the Foundation in partnership with Achieve, released the final installment of the 2016 Millennial Impact Report, which sought to understand whether a Presidential election context would change how millennials engaged with the causes they support. The Report is part of the larger, and longer term Millennial Impact Project, which seeks to amplify the voices of the millennial generation—more than 75,000—through research, discussions and convenings. Our hypothesis going into the 2016 Report was that the presidential election would, in fact, change how millennials engaged in and with social causes. But—spoiler alert—after three waves of quantitative surveys and a deeper qualitative post-election survey, the results show it did not. A little counter-intuitive, right? This may have been our favorite Report yet exactly for that reason. The results seemed to challenge everything we thought we knew about this “next greatest generation” of changemakers. Millennials prefer creating change among family and friends, rather than large networks. This generation may also have one more surprise left in store for us related to voter turnout. Prior to the election there was a great deal of speculation about whether or not millennials would show up to the polls on election day. Exit poll analysis from the 2016 election as reported by CIRCLE (not affiliated with the Millennial Impact Report) suggests that “young people voted at a similar rate to 2012—close to 50 percent.” And while exit polls should not be considered conclusive, they do offer an early look at voter engagement on election day. What remains to be seen now is more definitive data with specific breakdowns of the demographics of those who actually voted—including geography, education, income etc.—to help us better understand the mindset of this generation of voters. As more definitive data specific to voter turnout is released over the coming months (e.g., the Census Current Population Survey), we will take a fresh look at our survey findings to better understand how millennials did, or did not leverage their power to vote and the impact that had on the election. This evolved changemaker still engages in more traditional “activist” activities such as: rallies, crowdfunding and petitions on a variety of issues. At the same time they are also practicing more common day-to-day activities, such as: ordering lunch from a restaurant that sources its ingredients from local farmers; wearing clothing from brands with sustainable supply chains; and, using a ridesharing app to cut down on their carbon footprint. Millennials are interested in specific social issues at the macro level, consistently identifying education, wages, health care, employment and the economy as the areas of most concern to them. They act, however, at the micro level, getting engaged primarily with issues that are or have been close to their personal lives. Millennials are looking to effect change and make a difference through individualistic and personally gratifying action, but are doing so in a way that redefines and eradicates traditional labels. Millennials as a rule don’t have much trust in government to do what’s right. Instead, they put more faith in themselves to create the kind of change they want to see. As a result, they are signing petitions, volunteering for causes, connecting on social media platforms and acting within their own circles as ways to incite change. What caused the recent increase in civic and political engagement over the past few months? Does this engagement represent a new level of involvement or is it simply a short-lived reaction to the outcome of the 2016 Presidential election? Can we expect to see an increase in voting during the upcoming mid-term and 2020 Presidential elections? What does success look like when it comes to their efforts to champion the issues they care about the most? What is the relative value of a retweet vs. a change in policy vs. a large turnout at a rally for millennials? Who does this generation believe best represents its interests? Who do they believe is most effective when it comes to championing their interests? Leaders from government, business or nonprofits? 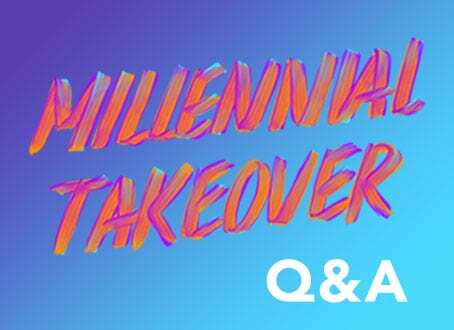 We at the Case Foundation will be watching closely over the course of this year in particular for any shift(s) in millennial engagement trends that may help to answer these questions. Already this year we have seen an acceleration and intensification of social sector engagement across all generations in America, not just among millennials. While we celebrate this everyday changemaking approach, we will watch carefully and report on how this generation participates in more traditional forms of civic engagement, such as voting. All signs point to millennials continuing to support the causes they care about through a wide variety of actions. In an ideal world, as more values based choices become increasingly integrated into everyday life and millennials continue to increase their influence and impact, it is possible that the prioritization and amplification of this ethos will become a global norm, not just a generational one. Organizations, businesses and even governments would be wise to take heed of this growing trend as donors, volunteers, customers and constituents look to their local communities to create the impact they want to have in the world. Be sure to check back in June for the release of the 2017 Millennial Impact Report at MCON 2017 where we will share new insights on the topic of millennial activism versus advocacy.